The monitoring of vibration levels can save equipment from destructive vibration and damage which can result in substantial repairs and downtime. All industrial machinery vibrates; the level of vibration should be monitored in order to prevent major damage. Monitoring via fixed or portable units can assist maintenance and production staff to keep plant and machinery running to capacity. all the way up to fixed transmitters & switches; we have the instruments to cover your every need. The Viboprobe is a versatile diagnostic tool which helps reduce maintenance & downtime. Operating with a 9v battery and complete with earphones to eliminate background noise. As all industrial machinery vibrates, the level of vibration is a guide to the condition of the machinery. Imbalance, misalignment & loose structures will cause an increase in the vibration level. 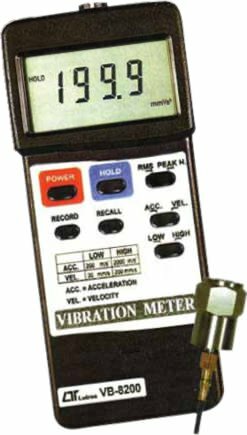 Our vibration meter offers a quick and easy way for you to check vibration levels and repair before failure occurs.
" Data hold, Memory with option to store data onto a portable handheld data logger & then download to a laptop computer (optional).
" Auto off extends battery life.